LNAV (lateral navigation), like a conventional localizer, provides lateral approach course guidance. LNAV minimums permit descent to a prescribed minimum descent altitude (MDA). 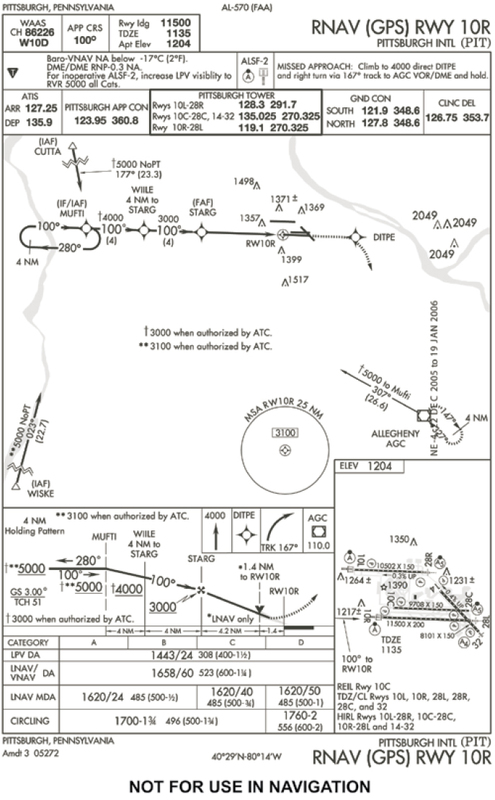 The LNAV procedure shown on the chart in Figure 3-48 offers an MDA of 1,620 feet. Figure 3-48. RNAV (GPS) approach. LNAV/VNAV (lateral navigation/vertical navigation) equipment is similar to ILS in that it provides both lateral and vertical approach course guidance. Since precise vertical position information is beyond the current capabilities of the global positioning system, approaches with LNAV/ VNAV minimums make use of certified barometric VNAV (baro-VNAV) systems for vertical guidance and/or the wide area augmentation system (WAAS) to improve GPS accuracy for this purpose. (Note: WAAS makes use of a collection of ground stations that are used to detect and correct inaccuracies in the position information derived from the global positioning system. Using WAAS, the accuracy of vertical position information is increased to within 3 meters.) To make use of WAAS, however, the aircraft must be equipped with an IFR approved GPS receiver with WAAS signal reception that integrates WAAS error correction signals into its position determining processing. 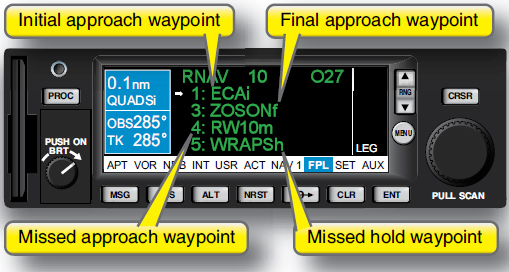 The WAAS enabled GPS receiver shown in Figure 3-49 allows the pilot to load an RNAV approach and receive guidance along the lateral and vertical profile shown on the approach chart in Figure 3-48. Figure 3-49. WAAS data provides lateral and vertical guidance. It is very important to know what kind of equipment is installed in an aircraft, and what it is approved to do. It is also important to understand that the VNAV function of non-WAAS-capable or non-WAAS-equipped IFR approved GPS receivers does not make the aircraft capable of flying approaches to LNAV/VNAV minimums. LPV can be thought of as “localizer performance with vertical guidance.” Procedures with LPV minimums use GPS information to generate lateral guidance, and IFR-approved GPS/WAAS receivers to generate vertical guidance similar to an ILS glideslope. Several manufacturers now offer FMS/ GPS RNAV units capable of flying approaches to LPV minimums. 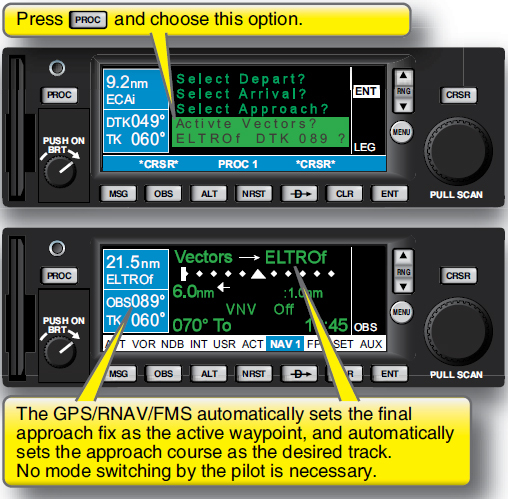 Figure 3-50 shows a GPS approach loaded into an FMS/GPS RNAV. As previously noted, approaches must be selected from a specific approach menu in the FMS. The software then loads all of the waypoints associated with that procedure from the database into the flight route. It is not possible for you to enter or delete, separately or individually, waypoints associated with the approach procedure. Once loaded, a GPS or RNAV (GPS) approach is shown in the FMS display as a collection of waypoints with a title that identifies the approach. Four waypoints in every approach procedure have special designations: (1) initial approach waypoint; (2) final approach waypoint; (3) missed approach waypoint; and (4) missed holding waypoint. Most FMS require the pilot to choose whether to simply load, or load and activate, instrument approach procedures. When ATC tells you to expect a certain approach, select that approach from the menu and load it into the flight plan. Loading an approach adds its component waypoints to the end of the flight plan, but does not make them active. Once ATC clears you for the approach (or, alternatively, begins providing radar vectors to intercept the final approach course), you must remember to activate the approach to receive course guidance and auto-sequencing. You must be careful not to activate the approach until cleared to fly it, however, since activating the approach will cause the FMS to immediately give course guidance to the initial approach fix or closest fix outside the final fix, depending on the unit’s programming. In the case of a vectors-to-final approach, activating the vector-to-final causes the FMS to draw a course line along the final approach course. Once you have loaded and activated the GPS or RNAV (GPS) approach procedure, flying it is similar to flying between any other waypoints in a programmed flight route. However, you must be prepared for two important changes during the approach. The first important change occurs when the aircraft reaches a point within 30 NM of the destination airport. At this point, regulations require that every GPS-based FMS/ RNAV unit increase its sensitivity and integrity monitoring (receiver autonomous integrity monitoring, or RAIM, which continuously checks GPS signal reliability and alerts you if RAIM requirements are not met). If the system determines that RAIM requirements are met, the FMS/GPS RNAV unit automatically switches from en route sensitivity to terminal sensitivity within 30 NM of the destination airport. Terminal mode increases the sensitivity of the course deviation indicator (CDI) from 5 NM to 1 NM. The FMS/GPS RNAV displays an annunciation to let you know that it has switched from en route sensitivity to terminal mode. The second important change occurs 2 NM prior to reaching the final approach waypoint. At this point, the FMS/GPS RNAV unit automatically switches to approach sensitivity. At this stage, the FMS/GPS RNAV further increases RAIM requirements, and increases the CDI sensitivity from 1 NM to 0.3 NM (i.e., a full-scale CDI deflection occurs if you are 0.3 NM or more from the desired course). As long as the annunciation for approach mode is displayed, you may continue the approach. If, however, the computer fails to switch to approach mode, or the approach mode annunciation disappears, you must fly the published missed approach procedure. You are not authorized to descend further or to the MDA. Making changes to the FMS/ GPS RNAV after reaching the 2 NM point could result in automatic cancellation of the approach mode. If you arrive at the final approach waypoint and the approach mode is not active, you must fly the missed approach procedure. There should be no attempt to activate or reactivate the approach after reaching the final approach fix using any means—simply fly the missed approach procedure. As in conventional approaches, it is common for air traffic control to issue vectors to a GPS or RNAV (GPS) final approach course. Flying a vectored GPS or RNAV (GPS) approach is a simple matter of using the course intercept technique described in the previous section. The technique is illustrated again in Figure 3-51. 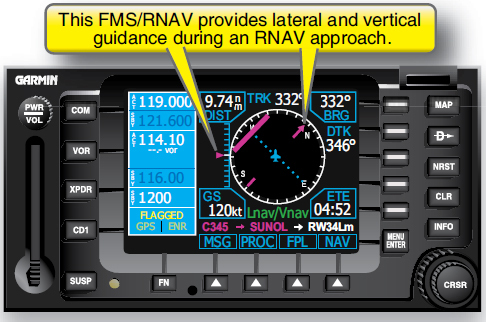 Many FMS/GPS RNAV units offer an automated solution to the problem of flying an approach in which the pilot receives vectors to the final approach course. Once ATC begins providing vectors to intercept the final approach course, you should activate the computer’s “vectors-to-final” feature, which draws a course line along the final approach course. This feature helps you maintain situational awareness while being vectored because the assigned heading is clearly seen in relation to the final approach course. As already noted, you should monitor carefully to ensure that the FMS/GPS RNAV unit switches to approach mode within 2 NM of the final approach fix (FAF). Figure 3-51 shows the vectors-to-final feature. The procedure required to use the vectors-to-final feature is illustrated in Figure 3-52. Figure 3-52. The vectors-to-final feature. When set to use the vectors-to-final feature, many FMS/ GPS RNAV units automatically set the FAF as the active waypoint; and set the final approach course as the desired track to the active waypoint. The most common error made during a GPS/RNAV approach is to forget to ensure that the approach mode has indeed engaged prior to beginning a descent to minimums. Routinely checking for the approach indication 2 NM before the final approach waypoint not only prevents this type of error, but also gives you a minute or so to remedy some situations in which the approach mode has not engaged. Listing several different approach minimums on a single instrument approach chart introduces the possibility of another simple type of error: using the wrong approach minimums. One way to avoid mix-ups is to verbalize the equipment being used and type of procedure being flown, and then search for the approach minimums with these details in mind. You must be absolutely certain of the certification, approval, and installed options of the advanced avionics equipment prior to flight planning. A common mistake made by pilots when they are learning to fly vectored approaches without a vectors-to-final feature is forgetting to set the FMS/GPS RNAV back to sequencing mode once established on the approach course. This error prevents the FMS/ GPS RNAV unit from switching to the approach mode 2 NM prior to the FAF. If you pass the final approach fix and the computer is still in nonsequencing mode, the approach mode will be disabled and you must fly the missed approach, report the missed approach and request another approach. 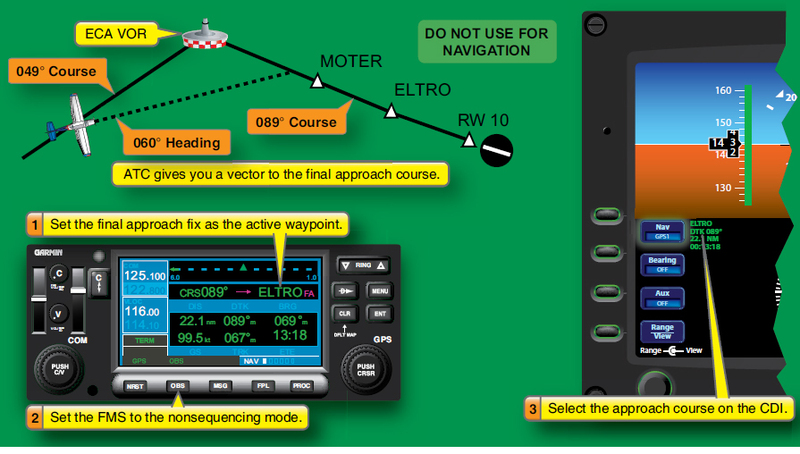 Load and activate a vectored GPS or RNAV (GPS) approach. Select a vectored initial approach segment. Determine the correct approach minimums and identify all pertinent mode transitions. Determine the published missed approach point (MAP), courses, altitudes, and waypoints to fly. Determine how missed approach guidance is selected.